Training My Squat — Focusing on what my body needs to do right then and there. I spend a lot time telling people what to think about as they set up a lift and maybe what to think about during their next set, but I have recently realized that I need to start talking more about what to think about while executing the lift. Thinking about what our body is doing throughout the entire lift is crucial to a successful heavy lift. Furthermore, it is a skill worth cultivating if you are trying to heal from trauma. As a trauma informed personal trainer and as a strength coach, I spend a lot of time helping individuals experience their movements from moment to moment — also known as embodied movement or mindful movement. For anyone attempting to lift weight near their max, minding what your body is doing throughout the lift will help ensure your body is moving as efficiently as possible. For folks healing from trauma, developing the ability to stay coolly present within one’s body even under stress, in this case the stress of lifting the heavy thing, can help increase tolerance for stressors outside of the gym. Most of the folks I work with spend the majority of their time in their heads and not in their bodies. Many adult novice lifters have to think through each step as they have not formed the muscle memory to lift. They come to class seeking instruction on what to do, and they turn that information into movement. They have to think about it. Learning to lift is a cognitive process for most adults and the first few days of learning technique can be so exhausting, not so much from the movements themselves but from thinking about the movements. As for people living with trauma, being in their body can feel very unsafe because it holds the trauma response. (By “trauma” I mean not the event itself but an unprocessed nervous system response to an overwhelming stimulus that resides in the nervous system.) Folks with trauma may dissociate under stress — even under the stress of exercise — but the only way to lift well and safely is to remain in your body at all times. 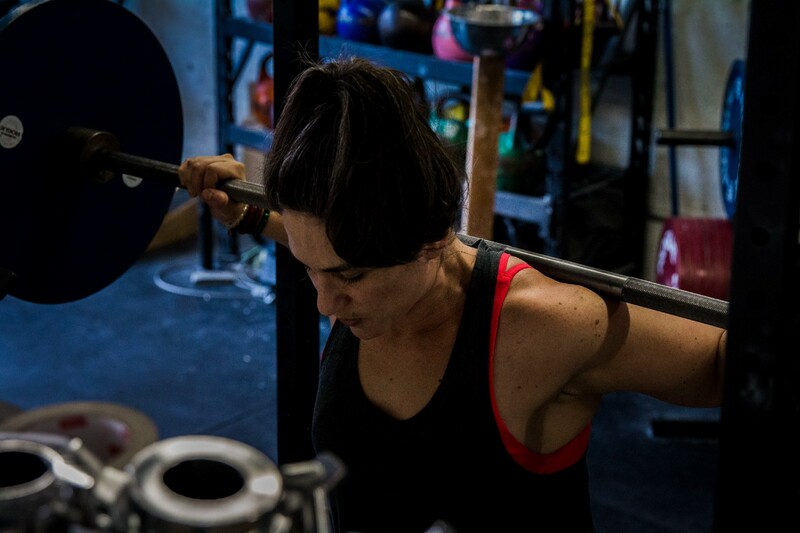 For people prone to dissociation, learning to lift means not only learning and processing technique, but learning how to really pay attention to their physical body while under stress. “The Window of Tolerance” is a term coined by Dr. Dan Siegel that has been adopted by mental health practitioners and professionals working with trauma. When you are operating within your window of tolerance, you are able to go with the flow of life. it does not mean your life is stress-free, but it does mean that you are able to weather life’s stressors while staying present and calm. We cannot remove stress from our life — nor would we want to. Excitement from thrill rides, a great workout, or taking on a challenging project at work are stressors that many of us enjoy or want to enjoy. Stress is not all bad and we want to be able to operate from a place where we can tolerate stress (good or bad) and easily move onto to the next thing, stressful or not. People living with unresolved trauma tend to have narrower windows of tolerance, which means they spend more time and energy being dysregulated or in a state governed by their primal limbic system even when in reality they are safe and do not need to fight, flee, or collapse. In fact, the more time we spend outside of our window of tolerance, the narrower our window becomes. My window became very narrow over time. The stress of unracking the bar and having the weight on me was enough to be triggering. Eventually squats became synonymous with flashbacks. Needless to say, when I was fixated on my anger, loss, and fear I was not embodied, I was not feeling safe, and I was not lifting safely. Injury became inevitable. If you lift with me, I am going to do my damnedest to keep you embodied as you move, because I want you to (a) train injury-free (b) be the best lifter you can. So, regardless of the population, a big part of my work is teaching people to become more embodied when they move in the gym. Okay, great. How do we do that? How do we make sure we, or our clients, are staying embodied during a lift? I am going to say something here that is likely not news to trainers and coaches, but whose significance might be overlooked. The lifter needs to think about what their body is doing not just in the set-up, but for every part of the lift. I have heard this in a bunch of different ways. Nuckols’ point is purely technical. But even in his technical manual he notes that if you do not keep your focus on your body’s movements as opposed to moving the bar you are not going to move as safely. Honestly, this can be harder than it sounds, especially if being in your body is hard and uncomfortable. I have been asked, “But how do you feel your body,” by numerous people who are using cues but whose proprioception or interoception is shut down, often due to trauma, injury, or chronic stress. My not-super-fun answer is that it will come with practice, discipline, and patience. That is one of the reasons I like to complement talk based therapy with somatic approaches to trauma healing. One can rebuild their proprioception and interoception through lifting which is both empowering and informative for the healing process. As Egan notes, the key is to break each part of the process into separate cues. As such a lifter creates something akin to a mantra for themselves to keep them focused on their body. Each time I squat now, I run through my set up checklist and then I think “feet, hips, brace, squat, back, rack” as I move through the squat. Those are my primary cues. They may vary because of a technique I am working to cultivate. Perhaps overtime I will need them less and less but that seems unlikely. Egan is an elite athlete who uses this approach at the Olympic level, so I suspect I, not an elite athlete, will always need this squat mantra to ensure my focus is on my body during the lift so as to not succumb to the stress of the lift itself. I understand you may be driven to lift heavy things for all sorts of emotional reasons. Instagram is filled with “I lift as anger management” quotes. And that is cool. Me too sometimes. I am not saying you cannot be driven to lift because of feelings, but you need to actually manage those feelings and energy to make it worthwhile. That is what embodied movement does — it allows you to manage and use the feelings. I assure you, whether or not you are paying attention to your big juicy emotions, that energy is there within you; however, if that is what you think about while you lift, (“I will not have this taken from me”) you are not using a feeling or managing it, you are being swept up in its thrall, which is oftentimes chaotic and distracting. This will ultimately derail your lift. Instead of being in the feeling you need to create a channel for it. You do this through embodied movement. I promise you that those big energetic feelings are still there — and are not going anywhere just because they are not in the forefront of your thoughts — they are in you looking to be channeled and processed. If you focus on moving your body in the desired way, your body will naturally contain, channel, and eventually process that energy. You will also lift better. So if you find yourself easily derailed by your head when you go to lift, consider breaking the lift down into cues to use as mantras as you work. If you have a hard time feeling your muscles engage or knowing where you are in space, keep practicing. I assure you it will come. If you enjoyed this post please let me know by hitting the applause button on the left as many times as you would like! (Like I think you can even hit it 50 times!) Thanks!